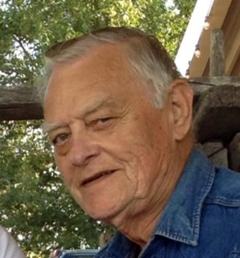 On Friday, April 5, 2019, Charles Wayne Gabehart of Natalia, loving husband and father of three sons, passed away at the age of 83 in San Antonio, Texas. Wayne was born on November 4, 1935 in Alice, Texas to Wes and Alice Gabehart. He grew up in San Antonio and attended ThomasJefferson High School where he met the love of his life in 9th grade, Gerry Guly, after asking to borrow a pencil which he never returned. On August 19, 1955 they were married (63 years this past year) and raised three sons, Charles, Tom and Bill. He worked for Humble Oil (later renamed to Exxon) for 33 years starting off driving a truck delivering gas to service stations and worked his way up to a senior sales marketer. This resulted in moves from San Antonio to Kingsville, Corpus Christi, McAllen and finally to Austin before retiring in 1988. He enjoyed deer hunting and fishing with his sons and many friends, but his true talent was playing the piano. He never really learned to read music, so he learned to play by ear and became a master at it. Growing up and all through adulthood, friends would often ask him to play a good old country and western song for them, he would grin and act shy for a minute saying he really doesn’t know any but would quickly sit down and entertain them for hours. After moving to the Devine area, he was invited to join the band “Country Swing” and played with them for many joyful years, playing dance halls and for special events all across the area. He also enjoyed playing his keyboards for the residents of various nursing homes in San Antonio and around Medina County, he would play any request to brighten someone’s day. He was known by all to be a good man and even a better friend by always helping those in need and greeting everyone with a smile, hand shake and doing his best to place a smile on your face with his quick wit. A service to celebrate his life will be held on Sunday, April 14th at Hurley Funeral Home in Devine at 3:00 pm. Family and friends are all welcome. In lieu of flowers the family asks of those who would like can make a charitable donation to Alzheimer’s Texas at www.txalz.org or a charity of your choice in memory of Wayne.